The term “beacons” is a buzzword that has been circulating the marketing industry for a few years now. While not an extremely new technology, according to findings by ABI Research, the use of beacon technology is set to hit the mainstream market this year, based on strong 2015 shipment data and contract figures. Previously, only a few major retailers were actively exploring beacon use, but 2016 is posed to be the year multiple industries, such as restaurants, begin testing the waters. First, in case you still are not 100 percent sure on how these small, portable devices work, let’s explain. Beacons can be placed anywhere in a restaurant or nearby location and rely on a smartphone’s Bluetooth connection to transmit information directly to a mobile app that's listening for their signal. These devices are highly cost effective and can be purchased through mobile solutions companies who specialize in providing software programs that manage the messages being delivered. The customer must first download an app, either a universal or branded one, that will listen for the beacon’s signal. Once the beacon is initially connected and the customer opts-in to receive information, the beacon will automatically begin pinging the smartphone. Messages are delivered each time a connected smartphone passes by a beacon, regardless if the app is open or not. Initially, you can begin deploying beacons by using them to send marketing messages, such as special deals and coupons, to customers. However, here are four additional creative approaches to take your beacon usage a step further. Instead of using employees to hold giant signs out front or hand flyers to potential patrons to garner their attention, beacons can essentially accomplish this same task by sending a message directly to their smartphones. By placing beacons within a few blocks in either direction of the restaurant’s location, those that have the app installed will receive an alert inviting them to receive a special offer or other promotion such as a half-off daily deal for lunch or dinner. No one likes long wait times when they are starving and craving the restaurant’s signature dish. However, guests might not remember to call ahead to check on table availability before they enter the restaurant. Beacons placed in the parking lot or down the street can alert customers before they walk in the door of the current wait times. While this approach might turn away a few potential diners who do not want to wait, the restaurant’s transparency will leave a positive, lasting impact for future visits. Most restaurants ask guests to fill out an online survey of their service experience, in exchange for a coupon or special deal. Unfortunately, the majority of people will most likely choose not to fill it out at a later time because it requires an extra step to take the initiative and go to the website. So why not bring the survey directly to the customer while they are still in the restaurant or as they exit? Beacons can send reminders to diners as they exit to provide their comments and opinions in real-time, providing an irrestible level of convenience that will increase the chances for participation. Beacons offer diners an opportunity to ordering from their tables and also can allow customers to pay their bills from their phones. Tailoring the in-store experience in this way vastly accomodates the overwhelming desire of today’s customers for self-service options. It is important to note that each time the beacons deliver a message, they collect behavioral analytics. By collecting this information restaurants can adjust menus and promotions to correspond to their guests’ needs and wants. Additionally, owners should remember that no customer wants to be overloaded with information or too many alerts. 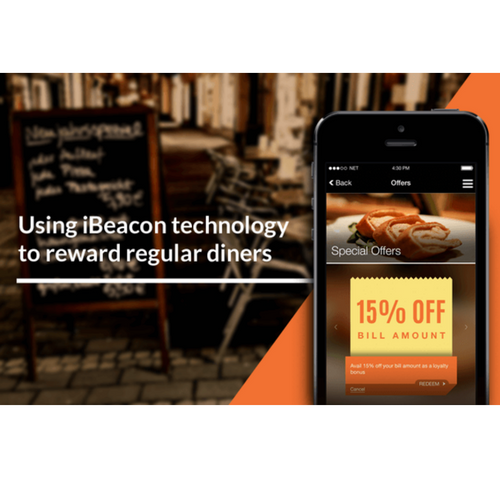 When used in moderation and appropriately, beacons can have a real impact on engaging customers in a more strategic way that will provide a better customer experience and ultimately, increase overall diner frequency! BeaconEdge gives you all the tools necessary to build your beacon and proximity marketing business. With training, marketing material, platforms and support, it's the best opportunity around.